PORTLAND, OR / ACCESSWIRE / July 12, 2017 / Eastside Distilling, Inc. (OTCQB: ESDI) (OTCQB: ESDID) ("Eastside" or the "Company"), a producer of award-winning craft spirits, today announced the Company has entered an agreement with Troika Spirits for making its famous Kachka Horseradish Vodka. Kachka's signature spirit will be hand produced in small batches by Mel Heim, Eastside's Master Distiller. Bottling will take place at Eastside's bottling subsidiary, Motherlode Bottling, supervised by Allen Barteld. Troika Spirits was founded by the owners of Kachka Restaurant, a Portland-based institution famous for its Russian cuisine and nationally recognized lineup of infused vodkas. Kachka Horseradish Vodka, Troika's only bottled spirit available to consumers outside the restaurant, is perfect to drink straight, or as the key ingredient in many mixed favorites such as a Bloody Mary's. Allen Barteld, CEO of Motherlode, a subsidiary of Eastside Distilling, commented, "Mel Heim and I are pleased to be entrusted by Troika Spirits to make and bottle their popular Kachka Horseradish Vodka. Motherlode is dedicated to working with local, Portland-based craft spirit companies. We stay true to craft recipes developed by individuals such as the Morales', who have created a Russian-inspired vodka that is loved by consumers around the world." Israel Morales, Kachka's co-owner, commented, "Kachka is known for an extensive selection of vodkas as well as our homemade infusions, the recommended accompaniment for a table filled with zakuski. Kachka's version of Хреновуха has always been a guest and staff favorite, made from a recipe achieved by much trial and error - and a chance tip gleaned from a waiter in Leningrad. 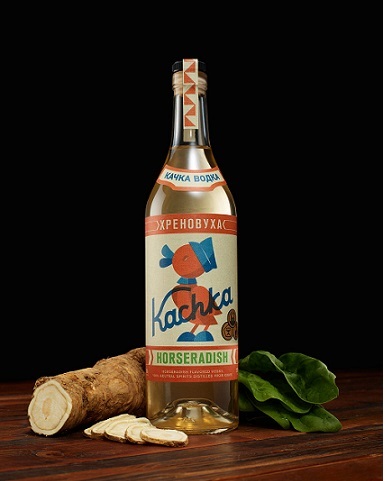 Each bottle of Kachka Horseradish Vodka is handmade with whole locally grown horseradish root and a drop of honey. It is available for purchase through select Oregon liquor stores and at Eastside Distilling tasting room locations. Pick up a bottle and do as a Belarusian babushka would do: clink, drink, eat, repeat!"